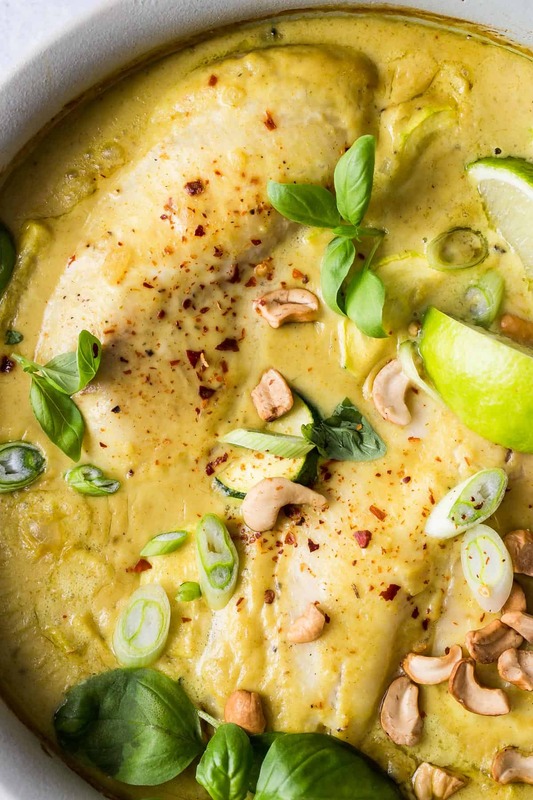 Thai style green curry sauce and fresh tilapia filets baked in creamy coconut milk and served with brown rice. Easy to make and just like your favorite takeout! 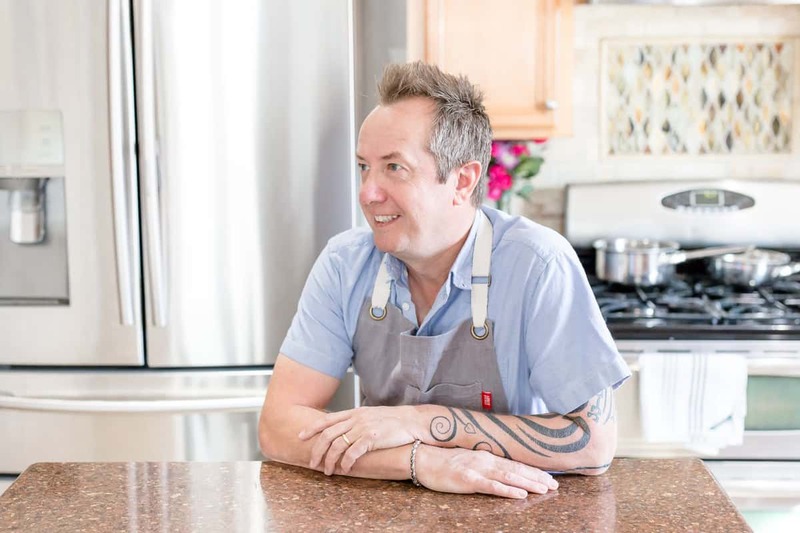 I am a Thai food fanatic and lucky to have so many awesome restaurants near me to choose from. With each place I visit I know exactly what to order but if I’m hankering for curry, I’ll usually always go with chicken. But, then I had fish in my curry, and my whole chicken love kinda went up in smoke. Maybe it was a texture thing. After covering these tilapia filets with the green curry coconut sauce and slow baking them in the oven, the flakes literally melted in my mouth. Tilapia is the perfect firm fish for this kind of recipe. It can hold up to the sauce but ends up being super light and flaky when you dive in and grab a forkful. All it needs is some salt and black pepper before adding the sauce, I threw on some dried red chilies just because spicy food is my thing. This recipe is my third in collaboration with Regal Springs Tilapia. You can check out my other two to see how versatile tilapia can be. Traditional Fish and Chips and Cioppino are very different recipes but the tilapia is delicious in both of them! Regal Springs is working hard to provide sustainable healthy fish. 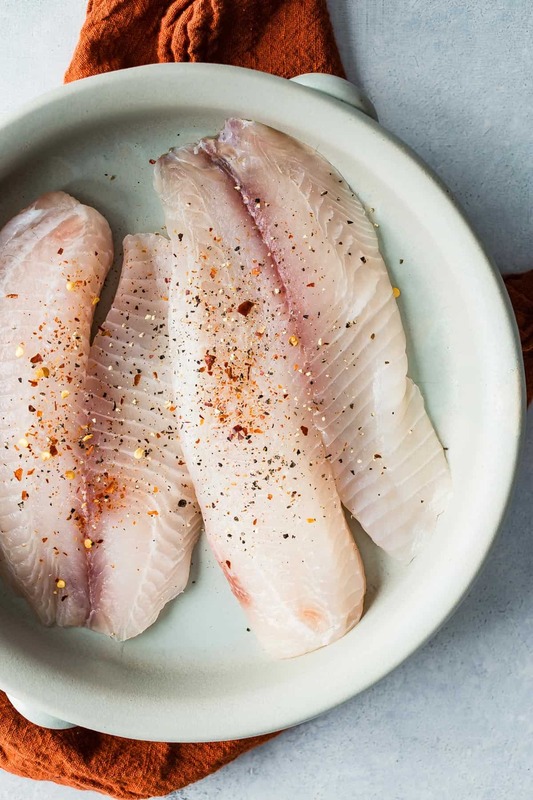 And since, it’s low in fat and high in protein, tilapia makes a great choice for easy weeknight dinners. Making traditional Thai curry paste might seem a little daunting, luckily there’s a few really good versions already made for you and can be found in the Asian aisle of your grocery store. 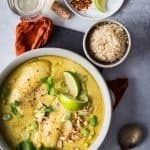 Mix it with the coconut milk and a few other easy ingredients and dinners almost done, it’s that easy and the family will be amazed that you didn’t pick this up from a restaurant! Click on this handy finder to see where you can pick up some Regal Springs Tilapia for dinner! Heat the olive oil in a pan and add the diced shallots and turmeric. Cook for about 3 minutes until soft over a medium heat. Add the green curry paste and stir well. Turn the heat to low. Open the coconut milk and transfer to a bowl. It'll be thick so use a whisk to bring it back to a milky consistency. Add two tablespoons of the milk to the pan and whisk to combine. Gradually ad the rest of the milk and bring to a simmer over a medium heat. Add the fish sauce and broth and stir. in a small bowl mix the water and cornstarch to make a slurry. Add to the curry and stir. Season with the salt and black pepper. Season the tilapia filets with a little salt and pepper and place in a oven safe dish big enough to hold both of them. Pour the curry sauce over the tilapia and place in the oven. Bake for about 30 minutes and the curry is bubbling around the edges. Remove from the oven and garnish with fresh bail leaves, crushed cashew nuts and green onions. Serve at once with brown rice on the side. This. Looks. Amazing. Absolutely gorgeous!!!!! Plus, hellloooo curry! 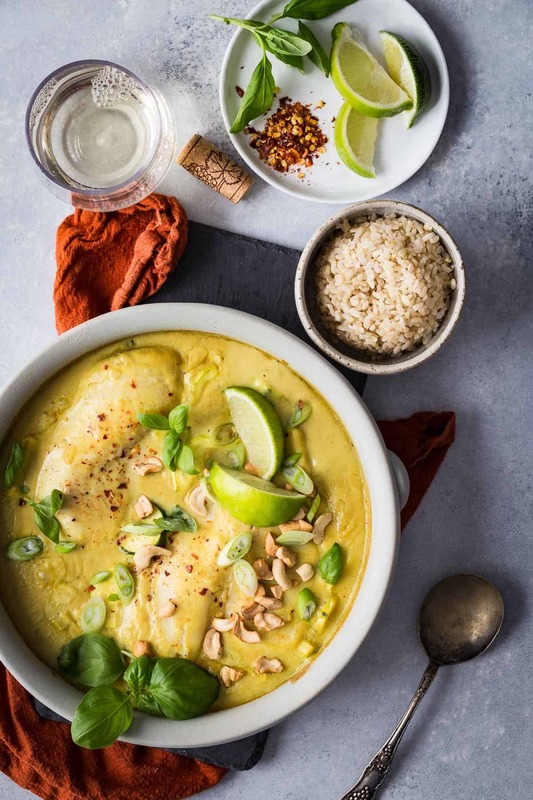 I love Thai curry, but I’ve never thought to try it with fish – brilliant idea! That is one gorgeous bowl of curry. I love the addition of the tilapia. I too, am guilty of curry=chicken. I will definitely be broadening my curry horizons with this one! I’m always looking for reasons to add turmeric… a great cancer fighter! Oh boy ! Excellent colours, idea, photos, everything ! Must try ! Thank you ! Yes, please! 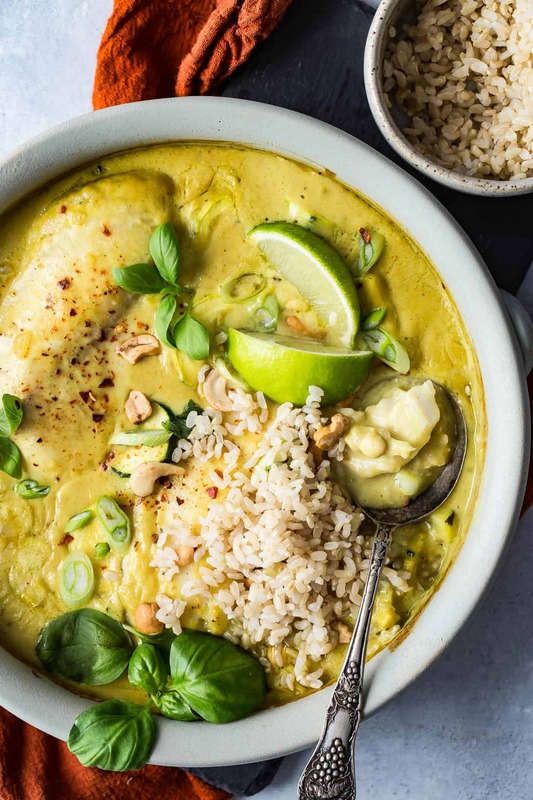 I am loving everything about this curry dish! Looks so delicious! Definitely a must make for dinner! When do you put the zucchini in? Don’t see that in the directions…. do you bake it with the fish in the oven in the sauce? Sorry Tobi, yes you bake it with the fish, thanks for the heads up. This looks amazing! One question though–would switching out the fish/veggie broth for chicken broth alter the taste too much, or would it be okay? I think it would be fine to switch Hannah! Where does the diced zucchini come in?